Brown the chicken pieces gently in a frying pan with a little sunflower oil (or some of the chilli oil you made earlier) for about 10 minutes or so, until they are firm (the meat will be fully cooked later, don't worry..). 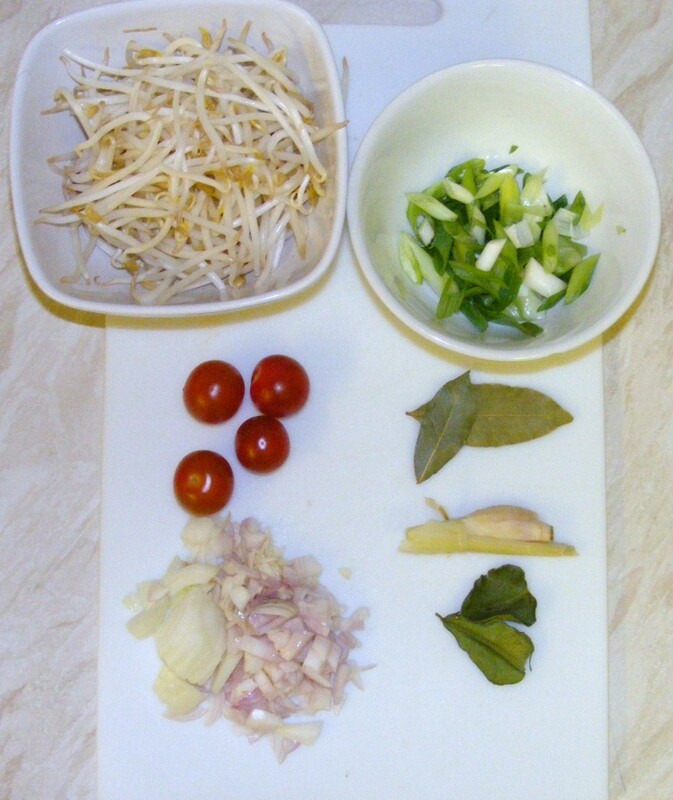 While they're cooking, coarsely chop the shallots, onion, spring onions, garlic and tomatoes. Wash the beansprouts (Mrs K likes to pinch the ends off the beansprouts, but she's a patient soul). 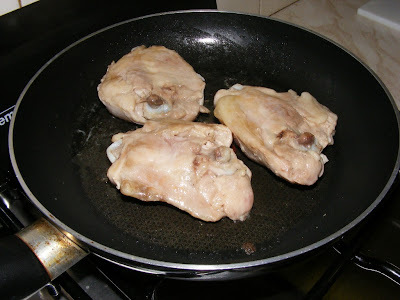 When the chicken is browned, remove it from the frying pan and let it cool for a few minutes. Then strip off all the meat from the bone and chop into small chunks. Put this to one side for the moment. Now add two glasses of boiling water, add the chicken pieces, stir and bring back to the boil. Crumble in the chicken stock cubes - notice we're not using any salt, the stock cubes are salty enough. Simmer vigorously for about 5 minutes or until the chicken chunks are cooked through. Taste the broth and add salt if you feel it needs it. 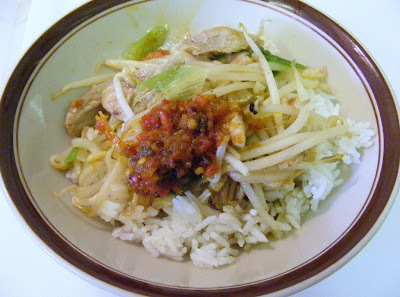 Finally, mix in the beansprouts and spring onions then cook for a further 20-30 seconds - we want them to stay crunchy. And that's it - ladle the broth over some rice in a bowl, then add a dollop of sambal goreng tomat. For the perfect flavour, cut a wedge of green lime and squeeze it over the soto. Yumm. (An optional tasty addition is a hard-boiled egg sliced in half - just put it in the bowl with the rice before you pour the soto over it). Hello, I am a big fan of this kind of this cuisine. But until today I still unable to cook soto ayam with a taste as delicious as sold on the street. Your recipe is a new way in preparing soto and worth a try. I will let you know the result. Thank you for your kind comment, hope it tasted OK - there are so many different varieties!